This is a traditional breakfast, lunch or light dinner meal. If serving it for lunch or dinner, it is often made with ground beef as well (500 gr.) If you want extra protein, vegetarian style, you can add cooked red lentils. My husband likes his eggs scrambled in, in addition to lentils in this dish. I like my eggs poached with runny yolks. The beauty of this dish is that I can do both in the same pan. Add lentils and mixed eggs to one side, and poach my deliciously runny eggs on the other. I always serve it with bread or biscuits to soak up the yummy juices!! Heat the oil and add the onion, and allow to soften. Chop the spinach roughly. When the onion is softened and translucent add the minced garlic, salt, tomato paste, black and red pepper. Add the spinach to wilt, and cover. If you prefer your dish saucier, add a half a cup of water. 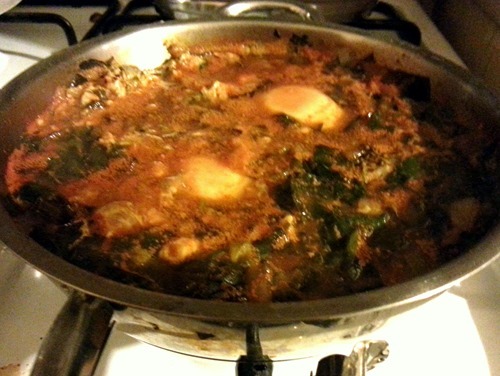 You may need to add a little more liquid if planning to poach your eggs in the spinach dish.